We all know the harsh truth, and that is that our skin changes with age. Of course, genes and lifestyle play a role in the skin ageing process, but there are certain aspects which we can control that have an impact on the ageing of our skin. Over time, the sun’s ultraviolet (UV) light damages certain protein fibres in the skin called elastin. The breakdown of elastin fibres causes the skin to sag and lose its ability to snap back after stretching. The skin is more fragile, bruises easily and takes longer to heal. While sun damage may not show when you’re young, it will appear later in life. It’s important to know the difference between UVA, UVB, and UVC radiation, as they play different roles in affecting your skin. These radiations are differentiated according to their wavelength. While both UVA and UVB contribute to skin damage, UVA rays are now known to cause premature ageing, resulting in wrinkles, skin sagging and changes in skin texture. UVB radiation is primarily responsible for skin burning. This leads to stimulation of the melanocyte and causes the development of an uneven skin tone. UVC ray’s penetration into our atmosphere is largely prevented by the ozone layer and generally does not play a factor in skin health. All UV radiation rays can affect the structure of the cell and in turn, may lead to skin cancer. 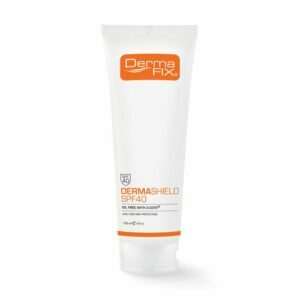 DermaFix Sun Protection is formulated to meet all the necessary requirements as per the South African legislation and has been SANS 1557:2013 and ISO 24444, ISO 24443 approved to protect the skin from both damaging UVA/UVB rays. 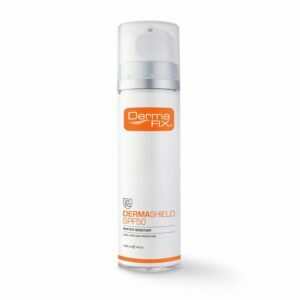 Furthermore, it offers water-resistant properties protecting the skin for up to 40 minutes whilst in water. WHAT TO LOOK FOR IN A SUN PROTECTION PRODUCT? There are various factors to consider when choosing a Sun Protection product, one of the most important being the choice of the SPF strength but there are in fact other factors to consider. The SPF (Sun Protection Factor) measures the amount of UVB absorption, but there is no method of measuring UVA absorption. The only way to determine if a sunscreen protects against UVA and UVB radiation is to look at the ingredients. A good sunscreen should have an SPF of at least 30 and contain avobenzone, titanium dioxide, or zinc oxide. In order to avoid premature ageing of your skin, you should use a certified sunscreen approved to protect against both UVA and UVB rays and not one with just an SPF designed to block burning UVB rays. WHAT ARE THE BENEFITS OF USING SUN PROTECTION? There are numerous benefits of using sun protection and they normally stem from being preventative to the precursors of ageing and hyperpigmentation. It cannot be stressed enough how important it is to use sunscreen regularly and liberally in order to prevent photo-ageing and damage. By adopting healthy lifestyle habits as well as following the advice on sunscreen given by your professional skin care specialist, you are steering yourself in the right direction towards a healthier-looking skin.